Kelly Wolf makes her way up the âStairway to Heavenâ ladder during the 52-kilometer Broken Arrow Skyrace on Saturday, June 17. Wolf would pass a pair of competitors on the final lap to claim first place. Over 500 competitors battled across the high-altitude terrain above Squaw Valley to finish one of the three events during Alpenglow’s second annual Broken Arrow Skyrace. 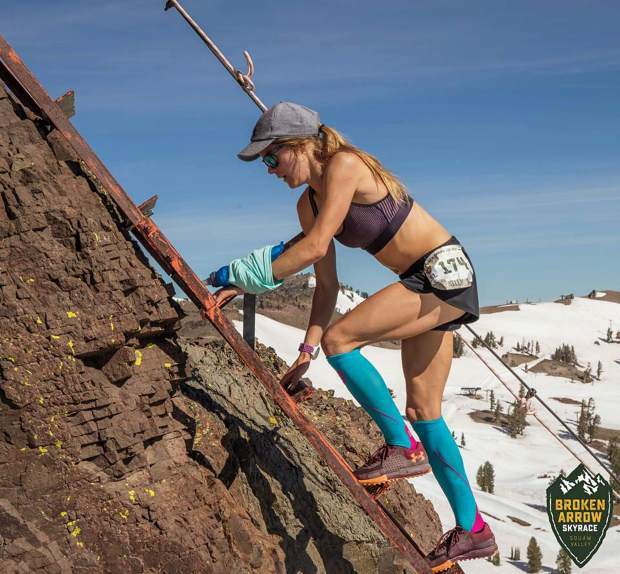 The races took place on Friday, June 16, and Saturday, June 17, featuring recreational to elite ultra runners on a course that ran from the Village at Squaw Valley to the top of the Squaw Valley Ski Resort, and along mountain ridges before returning to the valley floor. According to Alpenglow Owner Brendan Madigan, more than 750 runners from as far away as France and New Zealand signed up for the races, but only 570 of those crossed the finish line over two days of racing. The Skyraces began on Friday with the Vertical K, a 3.1-mile, 3,100-foot climb from Squaw Valley to Squaw Peak. Incline Village’s JP Donovan reigned supreme, reaching the top of the mountain in 41 minutes, 37 seconds to take first place. Donovan would cross the line nearly 2 minutes ahead of his nearest competitor. On the women’s side, Morgan Arritola of Boise, Idaho, took the win with a time of 47:18, outpacing her nearest competition by nearly 3 minutes. Truckee’s Lenka Sterling was the top local woman, finishing in fifth place with a time of 1 hour and 14 seconds. 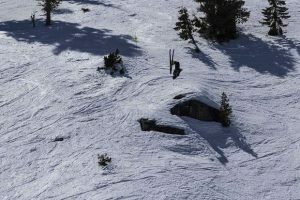 The competition continued the following day with the 26-kilometer and 52-kilometer courses, which took runners from the valley floor, to the slopes of Squaw Valley Ski Resort where competitors raced by late-season skiers. Racers would then have to navigate up ropes, steps carved into the ice, and up Squaw’s “Stairway to Heaven” ladder to the top of the mountain. 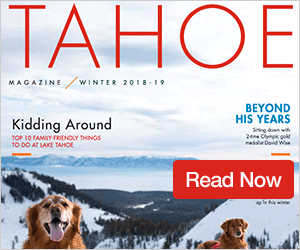 The course consisted of one, 26-kilometer loop from the Village at Squaw Valley to the top of the resort and back with 5,279 feet of elevation change. Winning the 52-kilometer race (two laps on the course) on the women’s side was Colorado’s Kelly Wolf. “It was exciting and kind of emotional,” Wolf said. “Lately, I’ve tended to get kind of emotional toward the ends of races or when the finish line is in sight. Partly, that has to do with, I had kind of a rough winter. I was injured for most of the winter — a couple of months I couldn’t run one step. I’ve only been running again for two months now. Standing in Wolf’s way were Salomon-sponsored runners Stevie Kremer and Anna Mae Flynn. Wolf trailed the two over most of the first lap, sitting in fourth place. She then passed a runner for third toward the end of the first loop, and as she began the ascension on the second lap a spectator let her now she was gaining on the first- and second-place runners. “I felt like I started running a little better and something clicked in my mind that this could be a competitive race for me, and I could start pushing it a little bit,” Wolf said. As she made her way up the mountain, she heard she was two minutes behind, and then a little later, one minute behind. Then she caught sight of the two runners, who had been working as a team. Wolf would make the pass just before the rope climbing section, and then pushed herself over the final leg of the race to win at a time of 6:02:38. Kremer finished in second at 6:06:51, followed by Flynn at 6:08:09. Truckee’s Rory Bosio was the top local finisher on the women’s side with a time of 6:26:36 for fifth place. On the men’s side, Utah’s Tayte Pollmann took first place in the 52-kilometer with a time of 5:03:17. 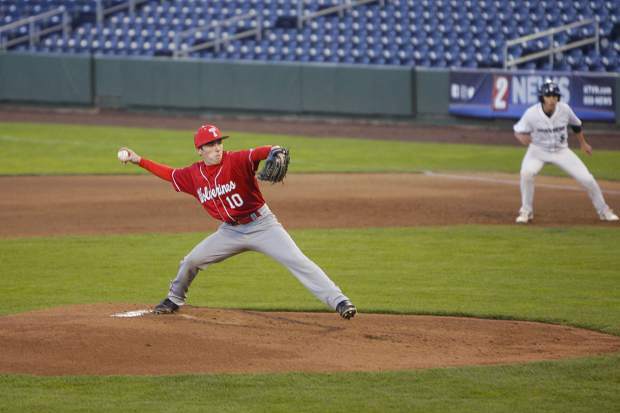 The 20-year-old finished in fifth place last year. This year, Pollmann was the first runner to reach the summit on the opening lap with Arizona’s Tim Freriks following close behind. Pollmann would then extend his lead to over three minutes during the final lap to take home the win. Ryan Weibel of South Lake Tahoe was the top local man with a time of 6:20:14 to finish in 23rd place. In the 26-kilometer division, Oregon’s Max King took first place with a time of 2:17:13. Donovan, who’d won the Vertical K the day before, was the top local finisher with a time of 2:29:17 for third place. On the women’s side, Arritola followed up her win in the Vertical K with a first-place finish in the 26-kilometer race with a time of 2:45:46. Truckee’s Liz Wigylus was the top local woman with a time of 3:16:33 for a sixth-place finish. 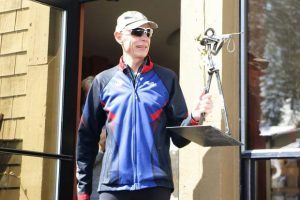 The Skyraces marked the first of five in the 2017 Altra US Skyrunner Series, and served as the opening to Alpenglow’s eight-day Mountain Festival.